On Friday, KVERT posted a great image of some of the lava flows from the Tolbachik eruption — as we saw in ASTER images recently, the eruption has produced a great network of lava flows, forming intersecting channels of lava as they flow over 10 km from the vent. This new image shows a bevy of lava flow images from this eruption, including features we’ve seen a many other basaltic to basaltic andesite eruption, like Kilauea and Eyjafjallajökull. What I did was annotate the new Tolbachik image and added some images from other eruption so you can begin to train your eye to spot these volcanic features. 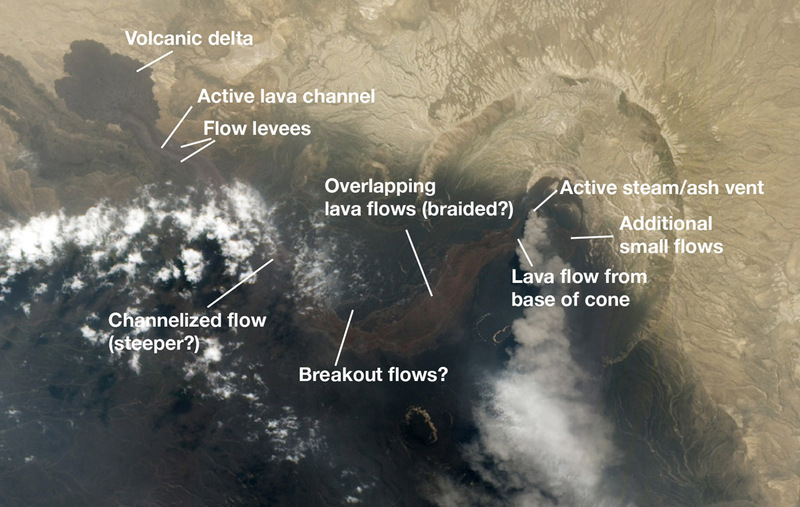 Lava flow channels: Like water, low viscosity lava like basalt or basaltic andesite will form channels — however, unlike water, many times the channels are formed by building up the banks of the flow (usually from previous lava flows of the same eruption) rather than downcutting (erosion). 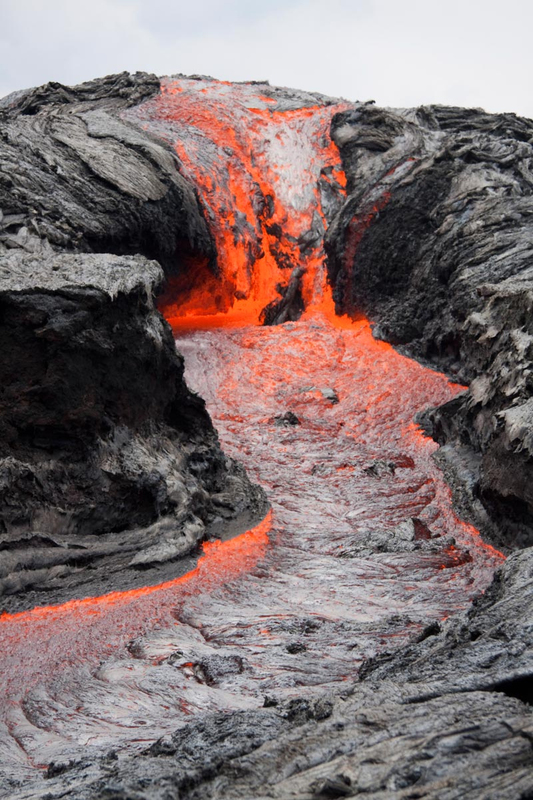 However, there is evidence that in some cases, lava can thermally erode the floor of lava tubes/flows, helping create channels by melting the floor of the channel/tube. You can see in the Tolbachik image that lava flows have meandered as well, as the outermost flows have a dusty of snow on them, while other parts are solid black. This means that the outer flows are cool enough to let snow accumulate – and barely visible in that image are some more recent channels that are black on top, so they too have cooled more than the active channel (look to the left of the active channel). Lava flow levees: These banks that help form channelized lava flows are called “levees” as they really are walls built up on the sides of the lava flow. In the Tolbachik image, you can see levees formed by previous lava flows – or check out these levees from the eruption of Nabro in Eritrea last year. Lava balls: Sometimes, parts of the levees break off and start to be carried downstream in the lava flows. These chunks of volcanic rock tumble and become coated in new lava. We call these “lava balls” and once the lava flow can no longer carry the block, they get deposited, either on the “shores” of the flow or they are merely stranded (much like larger boulders in a stream). Lava balls are pretty common features in active flow fields and they can get big – sometimes as large as cars. These features are common at places that have basaltic volcanism that produces pahoehoe and a’a lava flows. Now, most people, when they envision a’a, think merely the chunky, jagged blocks that capture that classic “ah! ah!” texture. However, a’a can move in a channel as well. That is what we’re seeing at Tolbachik: channelized a’a. The Fimmvörðuháls fissure that ended up being the opening salvo of the Eyjafjallajökull eruption had some great examples of channelized a’a (and blocky) lava flows. A’a lava can form channelized lava flows as easily as pahoehoe. In fact, pahoehoe tends to be more likely to form repeated surface flows that convert into lava tubes or compound lava flows. The Fimmvörðuháls fissure eruption from the first stage of the Eyjafjallajökull eruption, seen here in April 2010. Image: Boaworm / Wikimedia Commons. You can see more examples of these lava channels at lots of volcanoes – the 1984 eruption of Krafla produced a lava river and the constant eruptions from Kilauea can also generate lava flows in channels that can eventually crust over, forming lava tubes. These lava tubes are so well insulated that lava can travel long distances with cooling and solidifying, allowing things like the ocean entry that is currently occurring on Hawaii. These lava flows from Tolbachik are likely issues from the base of an incipient cinder cone — another common feature in these styles of eruption. At Tolbachik, these networks of anastomosing lava flows will continue to grow until the rate of magma erupting at the surface drops. Until then, the lava flows will continue to grow as new lava moves down these channels that allow for some degree of insulation, keeping the lava warm and fluid.